Yesterday we went into historic Saint Augustine just to roam around a bit and see what there was to see. Of course, lunch was an important part of the trip! There are a lot of interesting sounding restaurants around Saint Augustine, but it’s hard to be adventurous when you’re Gluten Intollerant. We were wandering around the amazing (and distracting) old streets and arguing over where to eat lunch. The Find Me Gluten Free app wasn’t offering many places with more than one or two reviews and nothing was sounding impressive. Then we literally stumbled over the perfect little place… Casa Maya. Mexican food is generally a safe bet for Gluten Free food… I asked the hostess if they had a gluten free menu and at first she gave me a blank look. I was afraid there was going to be a language issue (she had a strong Spanish accent and I took French in school… Why?! I never need French! ), but then she says ‘Oh, Gluten Free! Yeah, we have corn tortillas and salsa and corn chips and salads,’ and she’s pointing at lots of different things in the menu. Perfect. Once we were seated the hostess came back a second time and said we had a newer waiter, but if we had any questions we could ask for her. Our waiter said that the hostess had told him that we were GF and he reassured us that he’d check in with the kitchen and make sure everything was safe for us to eat. We started with an order of Salsa and Chips while our waiter checked that the spices on the chicken & pork were safe for us. 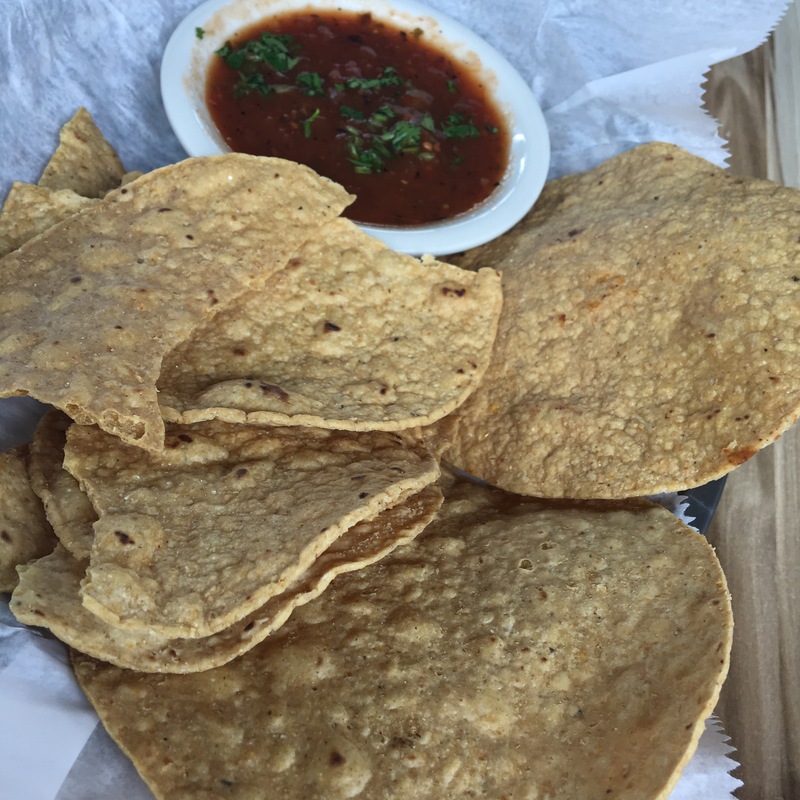 The chips were a little bland, but the salsa was good. Just a little bit of heat with tons of flavor. 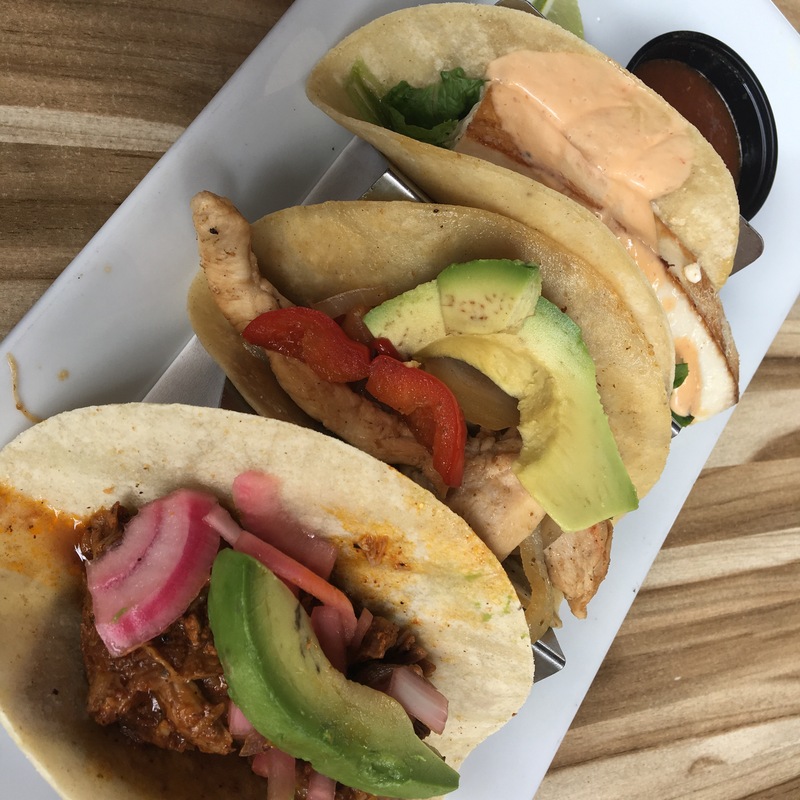 With the kitchen’s promise that the pork, chicken and Mahi Mahi were all safe, we ordered three different tacos. Each taco plate came with three tacos so we just traded tacos so that we all got to try one of each. Delish! I’m not sure which was my favorite, the Mahi Mahi was cooked perfectly, but wasn’t as flavorful as the Cochinita… which was really good… but the chicken was pretty heavenly too. Best bet? Take two friends and share so you can try them all! Mayan style pit pork, tender chunks of pork perfectly cooked and served with pickled red onions. Chicken strips marinated and sauteed with onions and peppers, served with avocado. Grilled marinated mahi, pico de gallo, lettuce, and home made chipotle mayo.